At the Plano office of Dr. Bunday, we can use our plentiful restorative dentistry choices to repair your teeth. If your teeth have suffered damage because of decay, infections, treatments, or injuries, Dr. Bunday can restore your smile! Depending on your repair needs, we can combine restorative dentistry services with our cosmetic dentistry options to complete a full-mouth reconstruction. 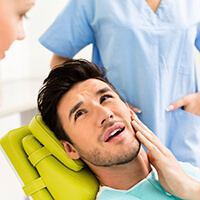 What can restorative dentistry do for our Plano patients? At Dr. Bunday’s restorative dentistry office, we can fix chipped, cracked, and broken teeth. We can also treat root canal infections, extract problematic teeth, and create tooth replacement devices. If you have a toothache, we can complete root canal therapy to clear out infection and alleviate discomfort. If your tooth is weakened by cavities, root canal treatments, or bruxism (teeth grinding), a filling and crown can strengthen and protect your tooth. At Dr. Bunday’s Plano restorative dentistry practice, we use composite tooth-colored resins. Sometimes the addition of a porcelain crown can ensure the health, function, and beauty of your restored tooth for years to come. Dental crowns are frequently used to repair damaged teeth, conceal cosmetic smile flaws, or replace missing teeth. Dental crowns fit over the top of damaged teeth to replace lost structure and provide added strength and protection to the tooth. For cosmetic purposes, tooth-colored ceramic dental crowns can be placed over the top of the flawed tooth to conceal the flaw. A row of dental crowns can also be fused together to replace one or more consecutive missing teeth. Called a fixed bridge, these dental prosthetics are attached to surrounding healthy teeth by dental crowns on both sides of the missing tooth or teeth. The dental crown and bridge process is comfortable and takes place over the course of two appointments. 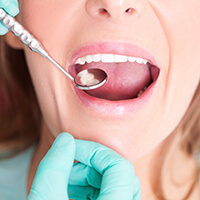 During your initial visit to our office, we prepare the tooth and capture bite impressions that will be used by our lab to craft your dental crown or bridge. Then, we place a temporary to protect your prepared tooth. Once we receive the custom restoration from our lab, you’ll return to exchange your temporary for a custom dental crown or bridge. For minor tooth decay or damage, we use fillings to repair smiles. Traditionally, metal amalgam fillings were the standard in dental care. Today, many dentists recommend tooth-colored fillings instead. 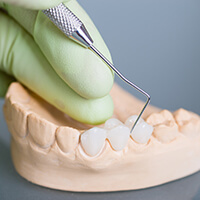 In addition to looking more like natural dental structures, tooth-colored composite resin fillings are also a more conservative treatment option. Amalgam fillings are crafted outside the mouth and held in position by wedges carved into natural dental structures. Composite resin can be applied directly to damaged teeth in a putty-like consistency where it seeps into even the smallest chips and crevices, creating a strong bond with natural dental structures. Once in place, we use a curing light to harden the resin material into position, and we smooth and polish the treated tooth, leaving patients with a fully repaired, natural looking smile. If you’ve experienced extensive tooth loss, we may recommend advanced tooth replacement prosthetics. Partial and full dentures allow us to replace any number of missing teeth or a full arch. Partial dentures are crafted to fit between remaining healthy teeth filling the gaps in patients’ smiles. Partials are created using a gum colored base to support the replacement teeth. Then, the prosthetic is held in position with metallic clasps. Full dentures are similarly crafted from a gum colored base that supports a full arch of replacement teeth. 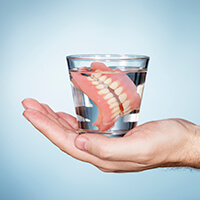 Because there are no healthy teeth to attach the denture to, a full denture is crafted to fit snuggly against the gums creating suction that holds them in place. We also offer dental implant supported dentures to provide more stability for your partial or full dentures. 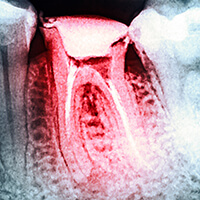 Root canals have a bad reputation for being painful, but these treatments can significantly relieve pain caused by damage or decay that accesses the inner pulp layer of the tooth where the nerve system is housed. When decay or damage accesses the nerve system of teeth, the result is a severe toothache and sensitivity to changes in temperature. A root canal procedure is simple. We’ll start by drilling a small access hole from the top of the tooth into the pulp. Then, the pulp and nerve structure are extracted through the top of the tooth. We replace the extracted dental tissues with a similar biocompatible tissue. Finally, we’ll reseal the access hole, and in most cases, we also place a dental crown to strengthen and protect the treated tooth. Dr. Bunday and our Plano dental team work hard to restore damaged teeth and help patients preserve their natural dental structures. However, there are some cases where tooth removal is the best solution to preserve oral health. When this occurs, we offer safe, comfortable tooth extraction for patients in the comfort of our office. We have the training and experience to provide tooth removal, and when necessary, we can also replace missing teeth in our office. We most often recommend extraction for patients who have experienced dental decay or damage that makes supporting a dental restoration impossible. Those who are in need of orthodontic treatment for crowded teeth may need to remove one or more teeth to allow their smile to shift into position. We most often remove wisdom teeth because these late erupting molars can cause crowding, dental shifting, or impaction.